Nandita’s Dream Workshops for children and adults? 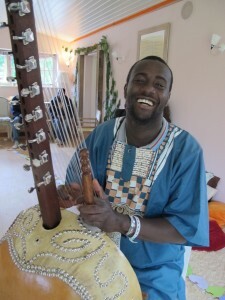 Here’s Sura Susso, the brilliant kora player on Nandita’s Dream CD. He also supported me leading a workshop. I noticed that we had grandparents and parents joining the children and I led a heart meditation journey, just as Rose had done, speaking, singing, leaving spaces. It was magical to be in a room of adults and children doing this together. We were all listening to our hearts. The delighted faces afterwards were feedback and joy and I’m wondering where sharing these experiences will lead us. What visions and ideas for our lives and the planet can we co-create together? 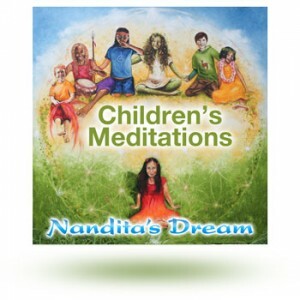 We have 2 free children’s meditation downloads on the Nandita’s Dream website. They are guided by two lovely girls. Melody leads us through ‘Tess Talks Trees’ and Rose leads ‘Nandita’s Heart Meditation’. Please share them. http://www.nanditasdream.com/ There’s been great feedback such as the boy who was concerned about moving schools and how listening to these helped centre him. However when Rose decided to lead a group of adults and children through the Heart meditation and I witnessed firsthand the effects of a child able to take adults deep into their own hearts, several things occurred to me. One is simply joy in her wisdom and her connection and her ability to share from her inner being. I also like children leading the way. Another is that Nandita’s Dream seems to be important to adults too. I often hear from adults playing the CD too and from work to uplift them. More on this anon. My dream is to become a successful teacher….Someone who can teach the students good things not bad things and correct them when they make mistakes. A good thing is to help the children to be famous people in the future – like Presidents, Lawyers, Bankers. A bad thing is when you teach and they don’t understand you. My dream for the world is that it should become a successful place for everybody. A place where everyone can feel comfortable where he or she is because people around the world are honest. I want to tell the children that they should live their dream and go towards what their heart tells them. I’m really happy when everybody is happy. I would like to become a scientist in Technology because I know how technology can help the world. But it is important that people don’t get lazy because of it. I would like to see a world of peace and harmony with no war, no people dying because we are careless like littering rivers and lakes because so many people depend on rivers and lakes for washing and cooking and some people die because of our mistakes. I would like to say to those children that don’t have an education….try and get some and be very determined about it. The fact that you don’t have money or parents to send you to school doesn’t mean that you shouldn’t try to educate yourself. Some people who didn’t go to school are very important people today. I’m happy when my family and friends all come together in one moment. I love my mom. Even though sometimes she can’t give me what I need, she tries until she gets it and she helps me a lot with my homework and education. 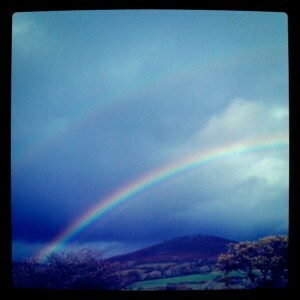 I wonder how many rainbows are shining across the world at the same time? Today the sun is sparkling rainbows in the leaves and the grass as the wind rustles and a cloud like an angel floats over the house. Dreaming and awake on an autumn day. A tiny wagtail bobbing by the window and a huge brown buzzard lifting up when I open the front door as I go outside to catch this magical play between rain and sun. My friend Melanie took this picture the other day at the top of the track. You can just see the double rainbow. Two rainbows in the same place since then. Are you inspired by rainbows? They always lift my heart. The colours seem to colour me. Smita Tomalin is a dreamkeeper for ‘Nandita’s Dream’. Wise, wonderful friend that she is she said this to me as we walked by the wild river. My heart tumbled with the river, full of recognition for YES. Yes has led me all over the world to meet with wonderful people and their yeses, seeing what we make together. Yes led me to the Achuar tribe in the Amazon and the Pachamama Alliance. Yes to singing. Yes got me out of bed this morning. Yes to the Earth. My biggest yes is to LOVE flowing through everything and everyone. The green is so golden this point in the autumn afternoon just before the sun goes down. Yes to heaven on earth… Love to hear your yeses. Memon from Nandita’s Dream has a look of Smita. 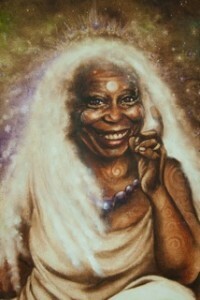 Some people say she has a look of Whoopi Goldberg? (good film casting) I’m getting a photo of Smita up soon so we can see. Do you recommend any inspiring children’s films – films that touch the heart, empower and are beautiful? My list has just grown to include ‘Fly Away Home‘. It’s the story of a girl who rescues goose eggs and the hatchlings take her for mother. She has to teach them the migration path South as the mother goose does. Her father devises an ingenious way and she takes to the air in a microlight plane to begin the journey. Wonderful bit where she has to go on alone and her father tells her how strong she is and she’s living her dream. 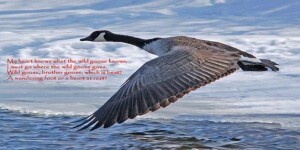 The cry of a lone goose called me straight out of bed this morning! And what about Whalerider? and Akeelah and the Bee? Those are my top 3 for now. Would love to hear about more. Photo courtesy of Bunny and Mark, travelled 60,000 miles on their 43ft ship Wild Goose, dreaming the dream. 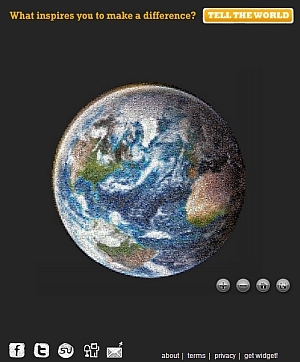 The beautiful picture of the Earth from space on the oneworldgroup website is actually made up of thousands of pixels each one of which is a message or photo from people in the world. 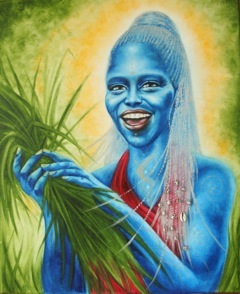 “Nandita was a dreamer,” continued Salassie in his sing-song voice. “What’s a dreamer?” asked Ayub. “A dreamer is someone who helps create the world with their dreams. Of course we are all dreamers. But for some of us, this is our path in life.” Nandita’s Dream. Does this process of creating go on and on? Always. Even if it drops into gentle waters for a while. There’s always more. Is that true for you? The inspiring Juno parenting magazine has an in-depth article about the Nandita’s Dream project by Sarah Patterson. It’s out now. Their online competitions section is also offering free Nandita’s Dream CD’s at http://www.junomagazine.com/category/competitions/ Competition ends this month. Also, the Pachamama Alliance is making it’s symposium training available via the web.